Tips for showing students how to give each other writing feedback, which benefits both the receiver and the giver. I recently participated in a two-session writing class, and at the end of the first session, we were tasked with writing a short scene that we would share and discuss in small groups the following week. Knowing I was to share my work motivated me to put time and effort into it. I was both anxious and excited—I was curious to see what others thought of my work and to hear both criticism and validation. Workshopping is a very active process, both intellectually and behaviorally, and requires students to read, formulate comments and suggestions, and discuss in a small group setting. We often think only of the benefits of receiving feedback on work, namely that others’ suggestions can help writers improve a piece of writing. Authentically giving feedback, however, is also crucial to students’ development as writers. 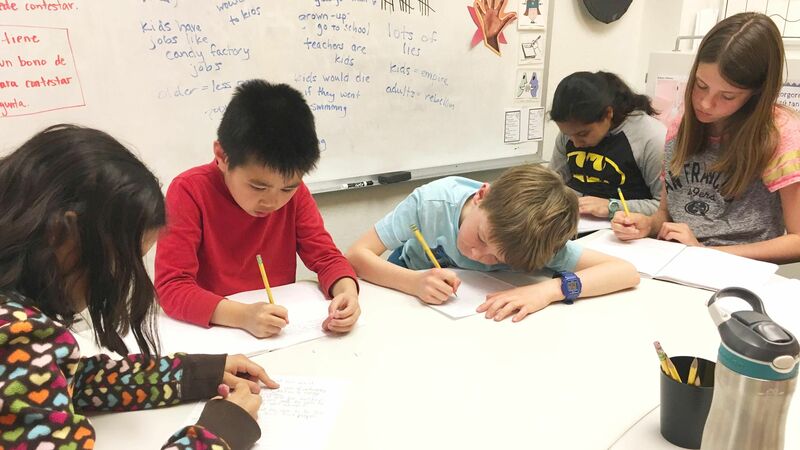 Giving peer feedback allows students to see concrete examples of what works and what doesn’t in similar types of writing, strengthens their language around writing, encourages them to think of their peers—and not just the teacher—as their audience, and helps them develop their “editor’s voice” that they can take back to their work. Giving good feedback takes practice. Scaffolding and discussing strategies for delivering feedback helps students become better writers and better peer reviewers. Scaffolding with a checklist: With my younger writing groups (ages 7 and 8), I’ve found some success in giving a checklist. It’s important that the checklist matches the skills covered in a term or unit. For example, ask students to check for a closing sentence only if you’ve specifically practiced this skill. Pairing students to check each other’s work gives them a taste of workshopping with specific guidance: Students help their partners revise and correct work using the checklist. I like, I wish, I wonder: This is a great tool to help students think about how to frame feedback in a constructive way. When reading each other’s work and giving feedback, they must discuss one thing they liked about the other person’s work, one thing they wished that person had done differently, and one thing they wondered about (for example, how a main character felt about or reacted to an event). This framework helps students focus on content and organization, rather than grammar, when giving feedback. It’s easier to find grammatical or spelling errors, but it takes creativity and critical thinking skills to give meaningful feedback. Areas/categories of feedback: With some of my older students (ages 10 and 11), I start workshopping sessions by having them list things they could look for when giving feedback. The list might include description, organization of ideas, punctuation, or sentence structure, for example. We divide the list into three categories: content, organization, and mechanics. As a group, we discuss which categories are more important to focus on early in the editing process, before they turn in and share their work. This is a helpful discussion because students become aware of what types of feedback they give and helps them brainstorm more meaningful edits. The act of workshopping aids student engagement. As I observed in my continuing education class, we’re naturally curious to see others’ work prior to completion and to see what they think of ours. I put more time into my writing when I knew others would read and critique it. And I was fully engaged during discussions of my classmates’ excerpts. After my learning experience, I completed two versions of the same activity with some of my younger students (ages 6 to 8). The first day, I had students evaluate their own work using a checklist. The second day, I had them evaluate a partner’s work using the same checklist. I noticed that when students worked in pairs and switched work, they were more focused and less likely to rush. They were also more critical of each other’s work than of their own—it’s difficult to gain perspective on your own work. Giving feedback and editing someone else’s writing allowed students to step back and identify areas of improvement. I recommend beginning each feedback session with a reminder that the workshop is a safe space that celebrates students’ work and focuses on successes and improvements rather than criticism. With time and encouragement, even students who are hesitant to share will participate in workshopping.